I’m sorry for my infrequent posts these past few months – but I have a good excuse. Our family is growing! And while I have been feeling pretty good, all things considered, blogging has taken a back seat lately. 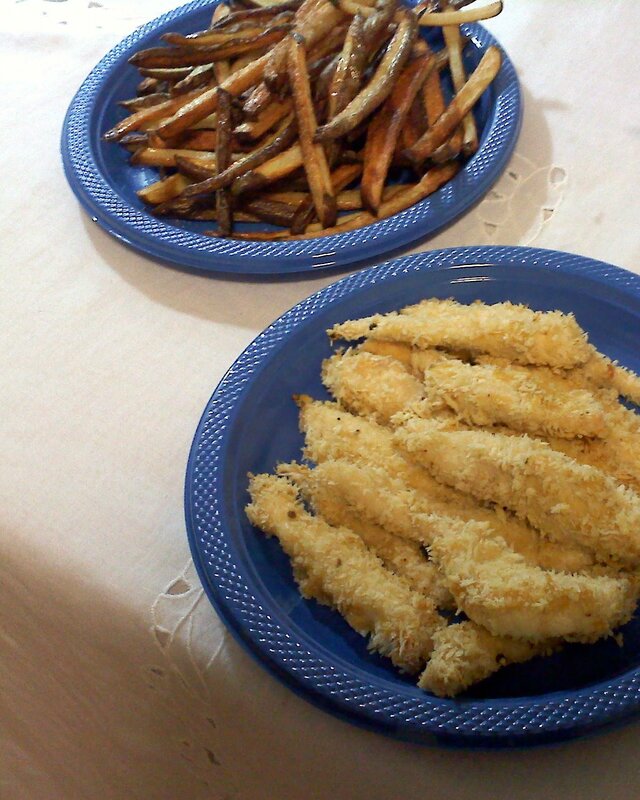 In the past few months, I haven’t felt much like experimenting in the kitchen. Slightly nauseated and continually tired, my cooking pursuits have been limited to grilled cheese and tomato sandwiches, whole wheat blueberry muffins, and mushroom cheddar omelets. But all of that has suddenly changed. You see, I think I’ve reached that nesting phase. For most women, I guess nesting means washing baby clothes and hanging mobiles. But not for me. No, in our house Jeff is in charge of decorating the nursery while I obsessively stock our freezer with meals and ingredients to enjoy when we’re too bleary eyed and exhausted to even beat eggs. Thankfully, our farm share’s bounty is well timed. The tomatoes have started to pour in, along with piles of fresh herbs and loads of garlic. This week, I threw it all in the oven, along with some green jalapeno peppers, and made a big batch of this spicy, smokey salsa. After I was done eating my fill of chips and salsa, I froze the rest. As it happens, cooked salsas actually freeze pretty well and retain their flavor for a few months in the freezer. The texture of the salsa might change when defrosted, but if you stir it well and heat it up again, it is just fine. 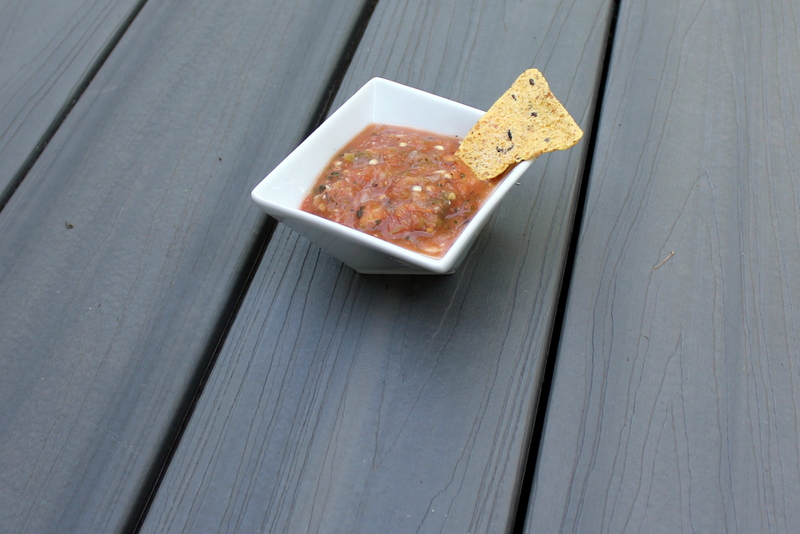 This salsa is really easy to make, and works well in all kinds of recipes. I froze most of my batch, and when I defrost it, I’ll probably use it to marinate steak for grilled steak fajitas. Or possibly I’ll toss it with some black beans, whole wheat pasta, and cheddar for a southwest pasta bake. I might even just spoon it into a tortilla with some scrambled eggs for a quick breakfast burrito. Preheat the oven to 450 degrees. Grease a baking sheet with half of the oil. Arrange the tomato halves, jalapeno halves, onion, and garlic cloves on the baking sheet and brush with the remaining oil. Roast the vegetables until the onion begin to brown and the peppers are blistered. Cool slightly. Working in batches, pulse the vegetables in a food processor and transfer to a large bowl. Stir in the cilantro, scallions and vinegar. Add salt to taste. Serve right away, refrigerate for a few days, or freeze to use within a few months. Where did Spring go? I have no idea what happened to the last few months, but all of a sudden, here we are. And this here and now is HOT. Weeks like this make me endlessly thankful for air conditioning. And even though we are enjoying the incredible luxury of central air while our neighbors sweat, I still have no desire to turn on the oven. There is nothing worse than a hot steamy kitchen on a hot steamy day. 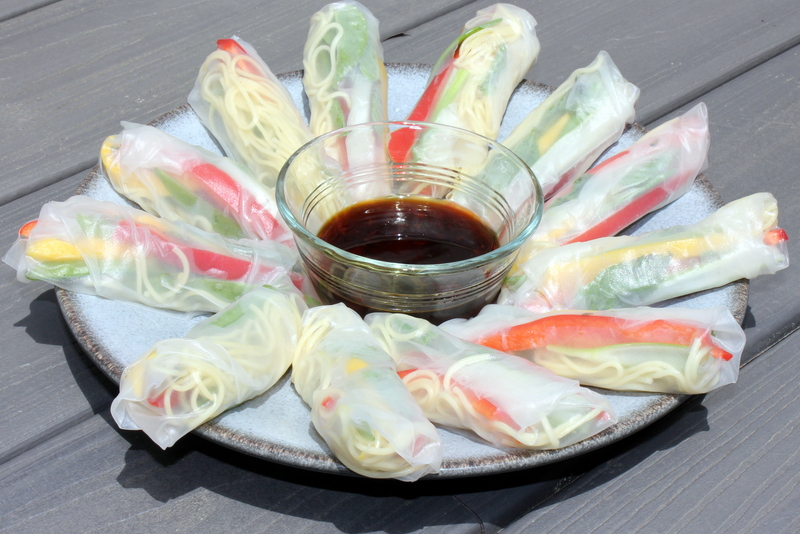 So we’ve been eating a lot of spring rolls. This is cooking without cooking, and the results are flavorful, light and fresh – my kind of summer food. And like all my favorite recipes, there is really no recipe here. There is a technique, for sure. But as for the ingredients, well, that’s up to you. You can pretty much stuff these light little rolls with just about anything that’s in your fridge. The fillings below are merely a suggestion, but I’ve used everything from shredded cooked chicken to pea shoots to fried tofu to Fuji apples. It pretty much all works. In terms of noodles, rice noodles are probably most traditional, and they work well. But I happened to have a box of angel hair pasta in my pantry so that’s what I used yesterday and they were lovely. I’ve also used seaweed noodles and soba noodles. They all are just fine – or you can feel free to leave out the noodles all together. Be patient with yourself when working with the rice paper wrappers. Try not to overstuff the rolls, and you’ll get the hang of it. And have fun! Toss the pasta with the oil. Arrange the veggies, mango and herbs on a cutting board so that they are easily accessible. 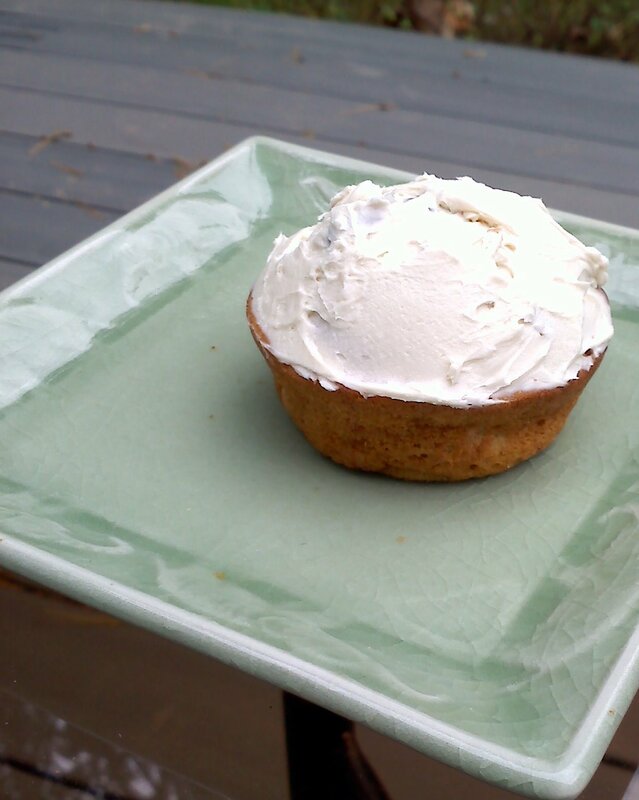 Fill a shallow dish, such as a pie plate, with warm water. Working with just one wrapper at a time, take one rice paper wrapper and soak it in the water until it softens, about 10 seconds. Once it is soft, remove the wrapper from the water and lay it on a flat surface. It may wrinkle a bit, and that’s fine. Place a small bit of pasta, lettuce, snow pea, pepper, mango, scallion, and basil in the center of the wrapper. Fold in the ends and then roll the wrapper closed to seal. Repeat with the remaining wrappers and fillings. 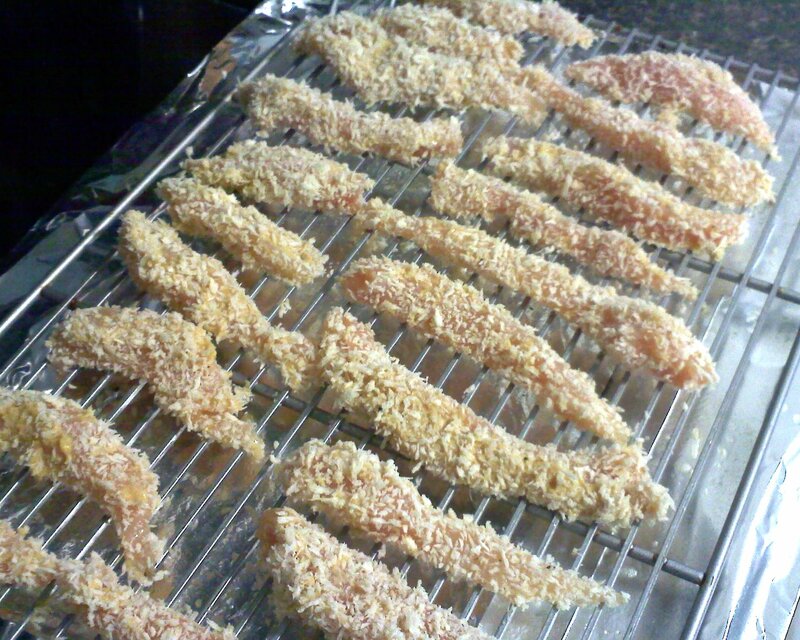 Meanwhile, to make the dipping sauce just wisk the chili sauce with the soy sauce. 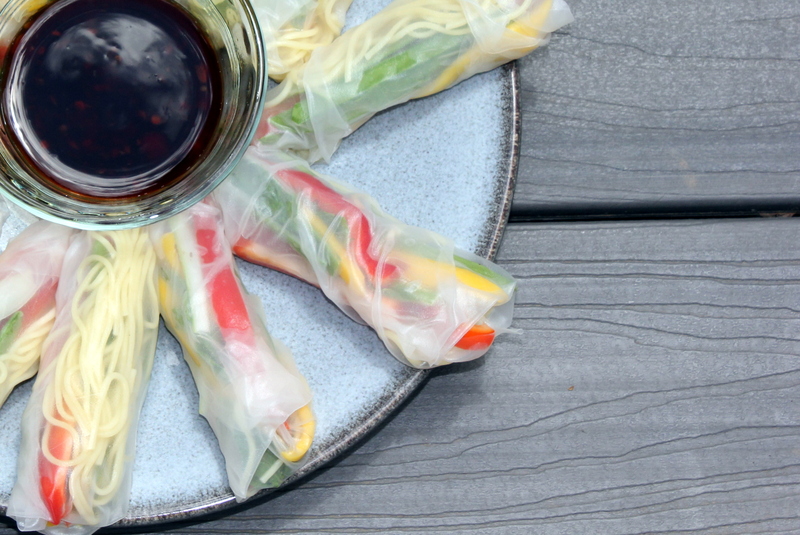 Serve the sauce with the spring rolls. These are best served right away but if you cover them well, they will keep a few hours in the fridge before the wrappers start to get a bit chewy. I have to admit that I think Valentine’s Day is kind of hokey. Teddy bears and silly cards are cute enough, I suppose, but overpriced flowers and prix fixe restaurant menus don’t do much for me. But this Hallmark holiday does have one major redeeming quality: chocolate. Who can be cranky about a holiday that prompts coworkers to share bowls of hershey kisses and husbands to bring home cherry cordials? Even better, of course, are the home made treats. 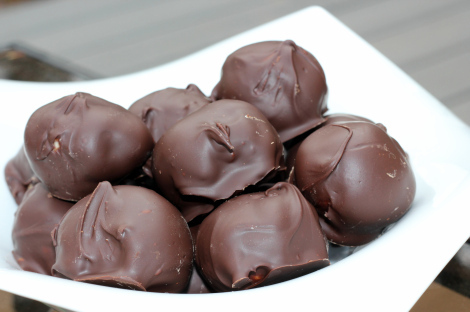 Nobody can resist chocolates from your very own kitchen. And on this one day, all chocolate is calorie-free. True fact. So go to town! 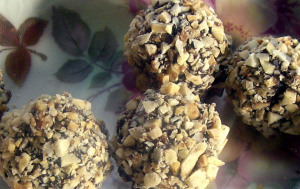 Below are a few of my favorite chocolate truffle-like recipes. Do you remember, a couple of years ago, when I shared with you all a few fun ideas for dressing up everyone’s favorite super bowl snack? 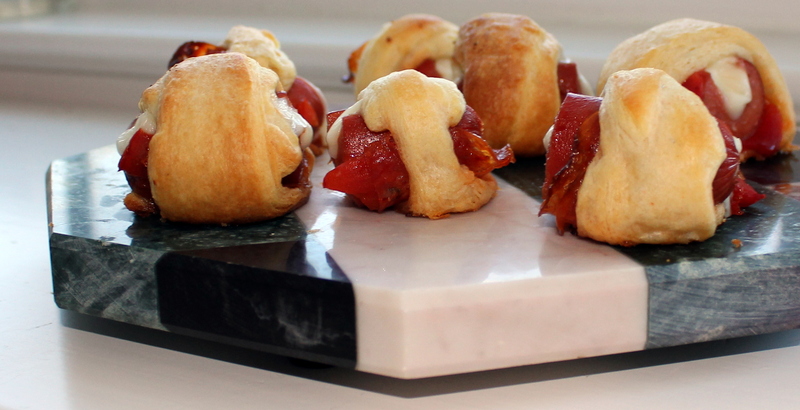 Gourmet pigs in a blanket are a major crowd pleaser. The last time around, I made Cubano Piggies, Parmesan Piggies, Piggies from the City of Angels, and Super Chili Piggies. They were gobbled up in seconds! 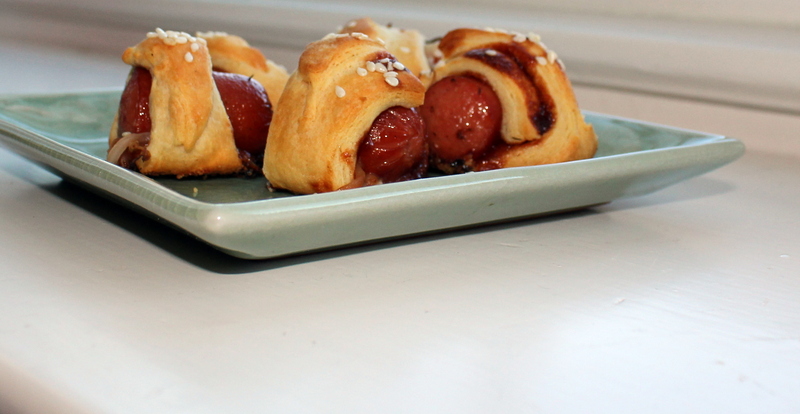 For Super Bowl LXVII, I have three more fun ideas for adding a little extra magic to the ubiquitous pastry-wrapped hot dog. The Reuben Piggies are a play on my favorite deli sandwich, and are awesome with a side of Russian dressing. The Asian Piggies are a surprising flavor twist, but the combo of hoisin sauce, bean sprouts, sesame seeds, and hot dog just plain works. And the Antipasto Piggies, with the pepperoni, cheese and peppers are Jeff’s catnip. 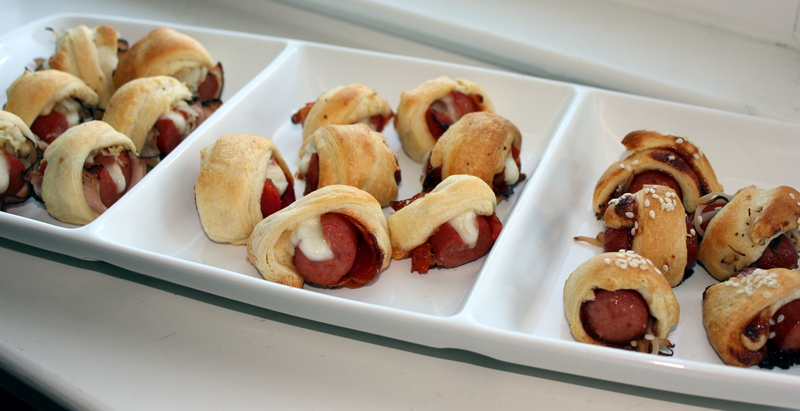 Of course, the possibilities for variations on gourmet pigs in a blanket are endless, so let your imagination run wild. And whichever team you are rooting for on Sunday, I hope you have a tasty spread of snazzy Super Bowl snacks to enjoy! Preheat the oven to 375 degrees. Cut each hot dog into 4 pieces, and then cut a small slit into the top of each hot dog piece. Stuff a small bit of cheese into each hot dog. Slice the crescent roll dough into 24 strips (they won’t be even but it doesn’t matter). Cut the pastrami into strips. To assemble the Reuben Piggies, lay a piece of pastrami on a strip of dough. Top with a small bit of sauerkraut, and then a piece of cheese-stuffed hot dog. Roll up the dough and press together. Place the assembled Piggie on a baking sheet and repeat with the remaining hot dogs. Bake for 10-12 minutes, until the dough is golden. Serve hot with the dressing for dipping. Preheat the oven to 375 degrees. Cut each hot dog into 4 pieces, then cut a small slit into the top of each hot dog piece. Stuff a small bit of cheese into each hot dog. Slice the crescent roll dough into 24 strips (they won’t be even, but it doesn’t matter). 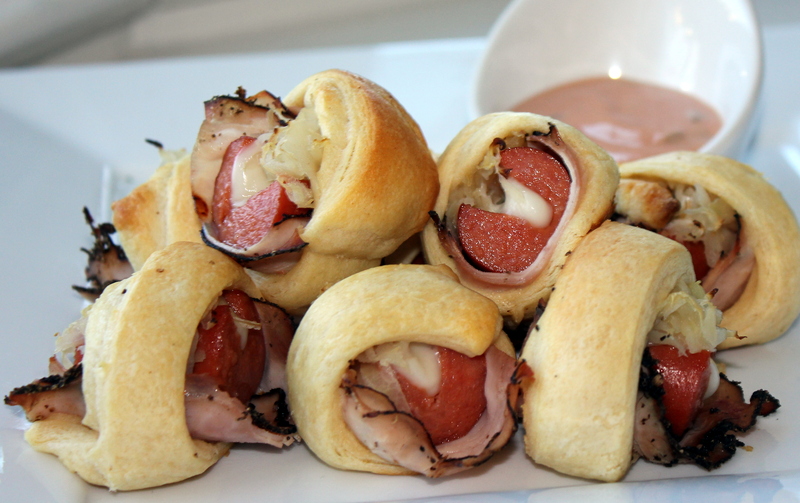 On each strip of dough, lay a folded piece of pepperoni, a slice of pepper, and a piece of cheese-stuffed hot dog. Roll up the dough and press together. Place the piggies on a baking sheet. Bake 10-12 minutes until golden. 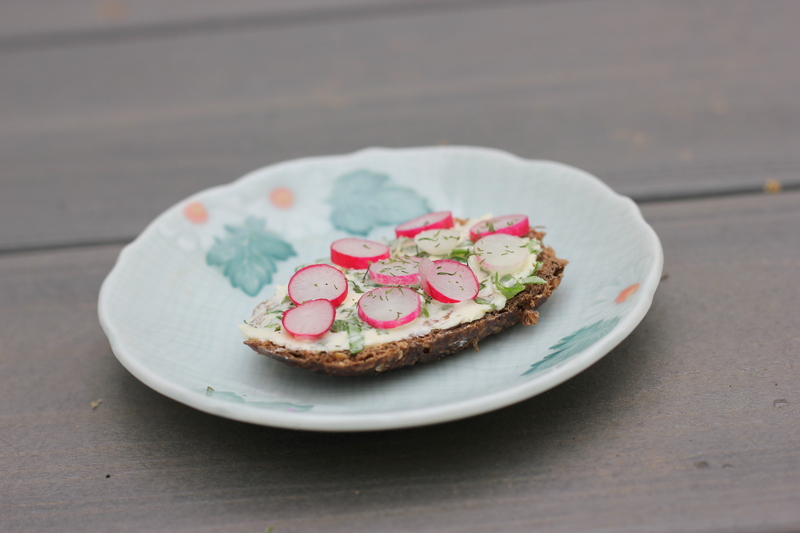 Remember in the spring when I made this lovely radish tartine? I was thrilled at the adorable little radishes growing in my garden. I have long dreamed of a beautiful and fruitful kitchen garden. I always believed that if I ever got to live someplace with a back yard, I would have pounds of squash and bushels of peppers. But as it turns out, even with that lovely back yard at my disposal, gardening is not an innate talent that I possess. I’m working on it. With advice from friends, and some trial and error, I may just get that fantasy garden someday. For now, I make do with easy to grow radishes. 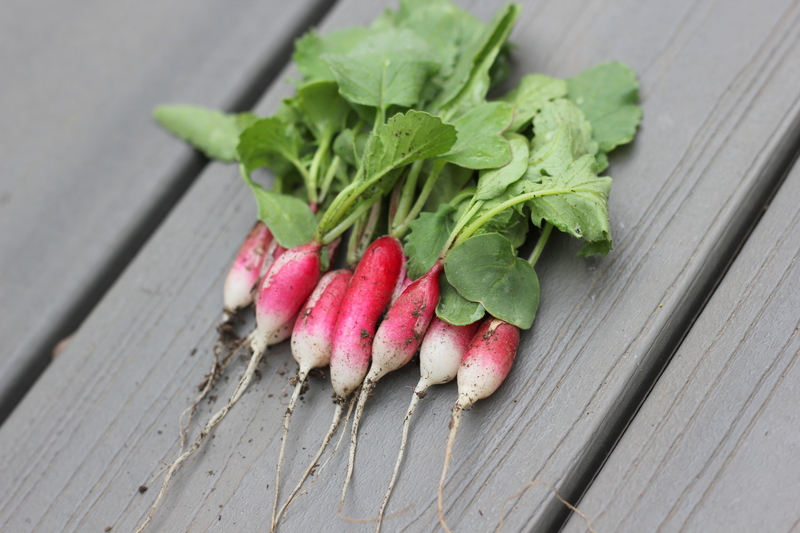 Radishes do especially well in cool weather, making them a great fall pick as well as a spring treasure. And at the moment, I have more radishes than I know what to do with. A lovely problem to have. I also have more radish greens that I can store in my fridge. I’m not one to waste food in general, particularly not food I’ve grown in my own garden. So I’ve been finding all sorts of ways to enjoy these greens, which remind me a bit of watercress. Young radish greens are tender and sweet, and add a nice bite to salads. More mature radish greens are a bit spicier and a little more woody, and are lovely sautéed with garlic in oil and tossed with pasta. If you are using radish greens from store-bought radishes, just be sure to pick bunches of radishes with the freshest, brightest-looking greens (this will ensure fresh, crisp radishes too). For this radish green and cashew pesto you can use young greens for a milder flavor, or mature greens for greater intensity. Either way, this is a unique sauce. 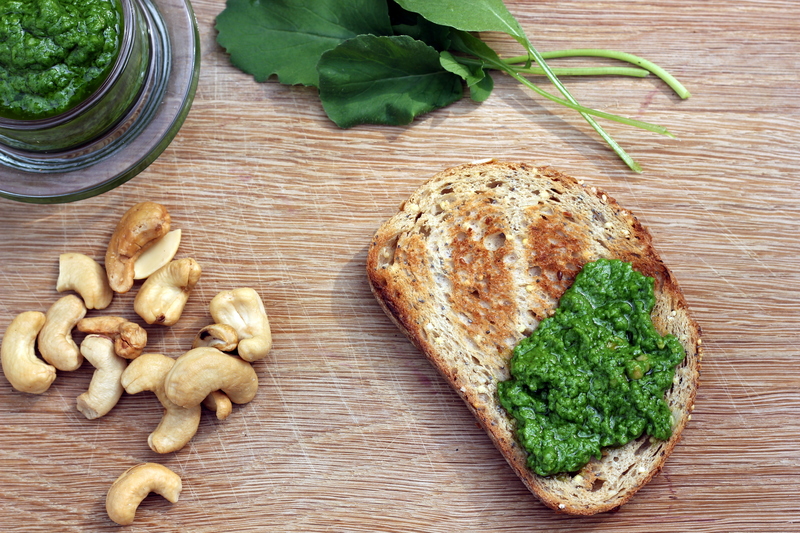 Don’t expect this to have any of the subtle sweetness of a traditional basil pesto. No, this pesto is bold and radish-forward. But it is lovely. It is wonderful on sandwiches, delicious over grilled fish, tasty tossed with fresh pasta, and fantastic stirred into scrambled eggs. My favorite way to eat it, though, is spread thickly on a simple piece of whole grain toast. This pesto will keep for a few days in the fridge, but I do plan to freeze my next batch. 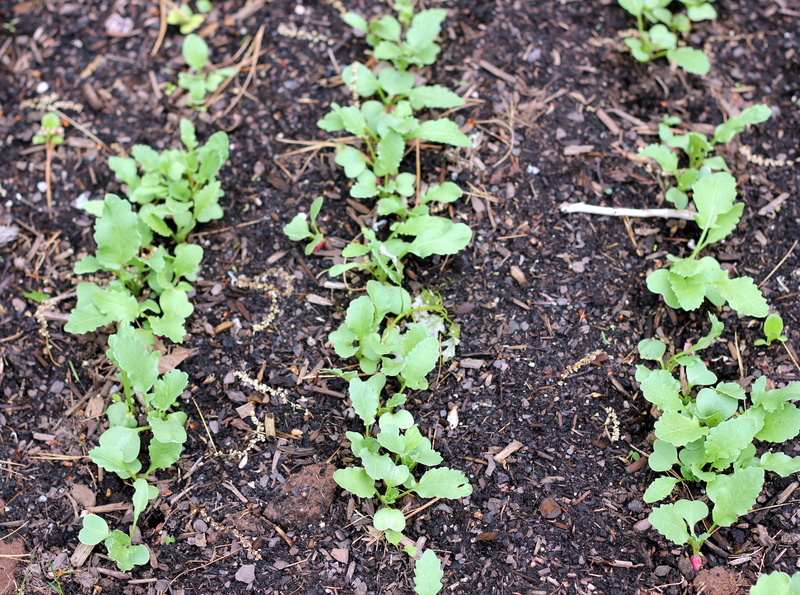 The flavor pop of fresh radish greens will be welcome on a cold day mid-winter, I am sure. 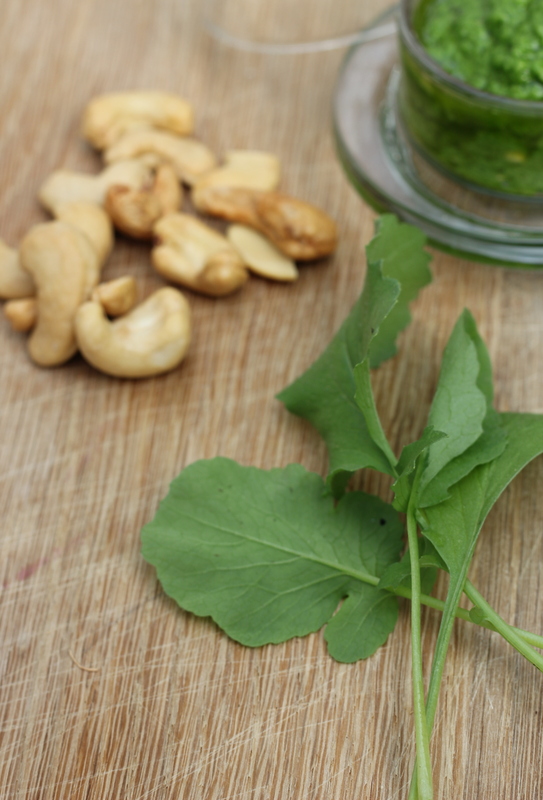 Add the radish greens, cashews, salt, and cheese to the bowl of a food processor. Pulse to finely chop the nuts and greens. Slowly, with the machine running, drizzle the oil into the bowl. Continue to process until the mixture is well combined and no chunks remain (stop and scrape down the sides of the food processor bowl as needed). Use immediately or store in an airtight container in the refrigerator for up to a week. Lately I’ve been blurring all the lines between meals. Oatmeal for lunch, waffles for supper, tuna melts for breakfast. Who came up with all these ideas about what should be eaten when? Of course, across the globe all of these lines blur anyway, so while eating fish at 8am feels a little thrilling to me, it’s none too shocking in a global sense. While I love to rebel by eating a hot fudge sundae for supper, even better are those dishes that bend the rules all by themselves. Like this pizza. The other night, Jeff and I set out to make a dessert pizza. We layered our crisp/chewy crust with sugar, cinnamon and ripe fruit. But something was missing. Something rich and cheesy. Really, you can’t go wrong with brie. Has brie ever made any recipe worse? I doubt it. And with this pizza, the combination of sweet and rich, crisp and gooey moves beyond the restrictive labels of dessert or dinner or breakfast. Frankly, this pizza works wonderfully for any or all of the above. It would make a compelling cheese course or a unique brunch. We made it again last night and ate it for dinner with a simple arugula salad. I’ve talked about grilling pizza before, last year when we made this Spicy Thai Chicken Pizza and I’m as big a fan now as I was then. The crust becomes both crisp and chewy, slightly charred and full of flavor. 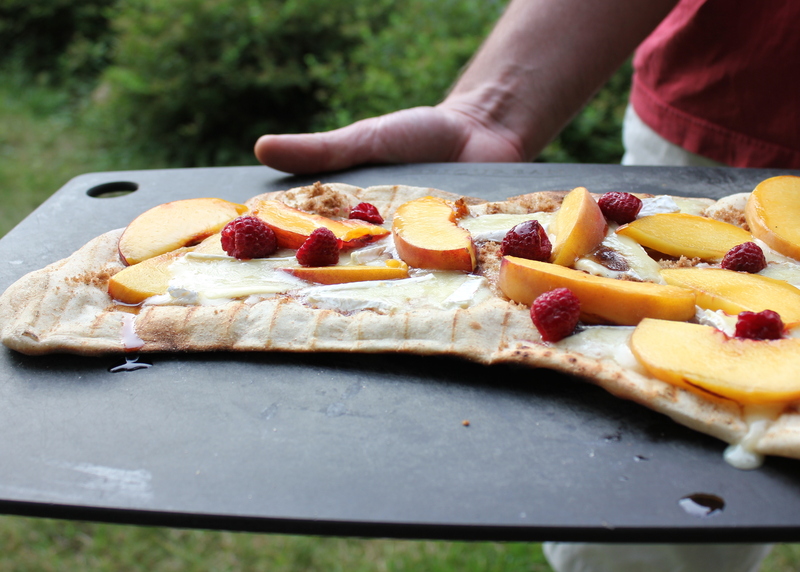 It works wonderfully with the soft, rich sweetness of the peaches and brie. You can make your own pizza dough, if you like. But I usually take the lazy way out and buy mine from a local pizzeria. Many will sell you dough if you ask. And some good grocery stores make their own dough too. I like to pre-grill the peaches to caramelize them a bit before slicing them up as a pizza topping. You don’t want to cook the peaches too long, or they will be too soft to slice. You just want a bit of color on the fruit, and to soften the flesh a bit. And don’t skip the cinnamon. It may sound like a strange pairing with the cheese, but the combination is surprisingly fantastic. Trust me. Actually, trust Jeff. It was his idea. Sometimes he’s smart like that. But only sometimes. Preheat a gas grill to medium and grease the grates. Roll out the dough thinly, using the flour to prevent sticking. Slice the peach in half and remove the pit. Press one tablespoon of brown sugar on the cut side of each peach half. Place the peaches on the grill, cut side up, and cover the grill. Cook for two minutes and then flip (you will lose some of the sugar, but that is ok). 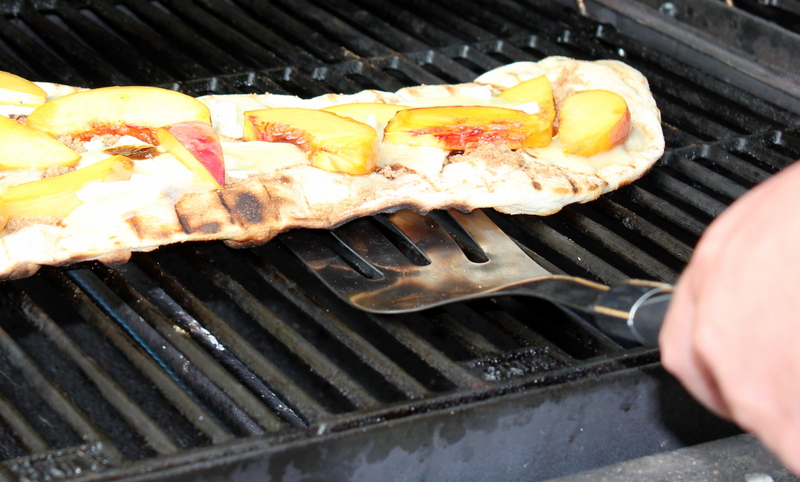 Grill the peach for just two minutes more and then remove from the heat. Allow the peach to cool before slicing. Meanwhile, carefully transfer the dough to the grill (it will bend into a strange shapes as you transfer it – just call it rustic and don’t worry about it). Cover the grill and allow the dough to cook until the bottom gets rigid and slightly charred. Flip the pizza dough (Jeff has developed a two handed method with a spatula and a set of tongs, but go with whatever works for you) and move quickly to sprinkle with the remaining sugar and the cinnamon. Top evenly with the peach slices and the brie. Close the grill and cook just long enough to let the cheese melt slightly, only a couple of minutes. Remove the pizza from the heat and sprinkle with the raspberries. Let the pizza cool for at least 5 minutes before slicing. It doesn’t take long after coming home from vacation for the steady stream of daily to-do’s to wipe out my holiday induced calm. A couple of late nights at work, a family event or two, an overgrown lawn, and I’ve almost forgotten that I ever went to Greece. Although it’s only been a few weeks, those lazy days on the Aegean sea seem like ages ago. 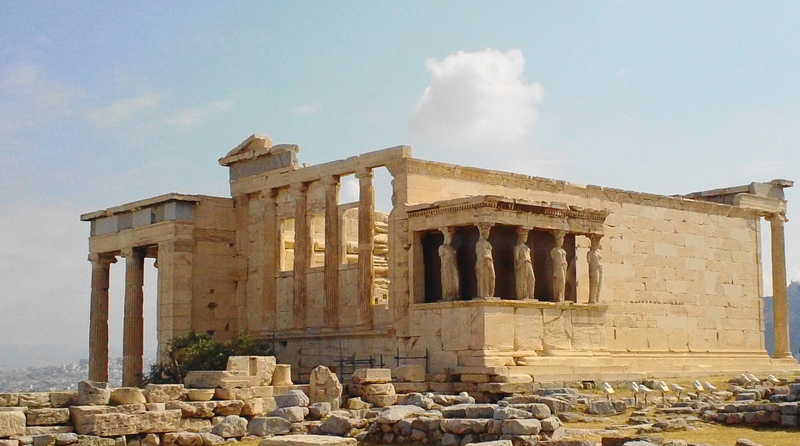 If it weren’t for all of those lovely photos, I’d wonder if we even saw the Acropolis, or explored the mountains of Crete. Does this happen to you? Does your habitual stress erase your vacation happiness? In an effort to bring back those calm, sunny holiday hours, Jeff and I have been gravitating towards the food and drink of our vacation. A tiny cup of Greek coffee in the afternoon, a few honeyed pistachios after dinner. And most of all, this flavorful olive paste. At almost every meal in Greece, we were served a big basket of country bread, a little dish of pungent olive oil, and a generous dollop of intense olive paste. 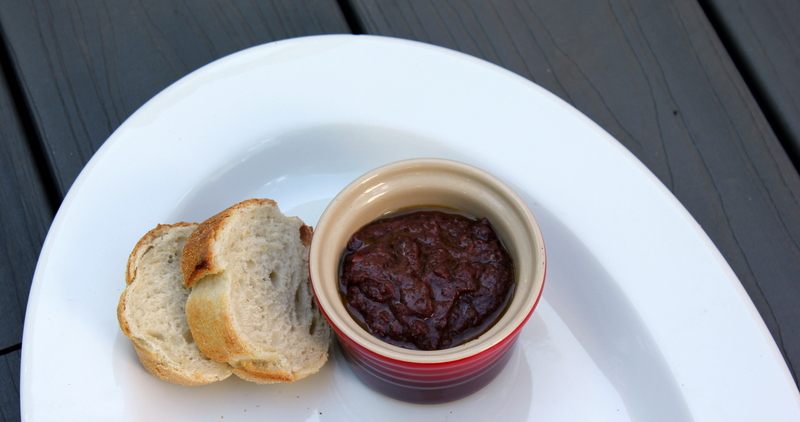 Even Jeff, a proclaimed olive hater, would slather this olive paste over crusty pieces of semolina bread. Here at home, we’ve been devouring this olive paste as a snack, spread on sandwiches, tossed with grilled vegetables and drizzled over baked chicken. 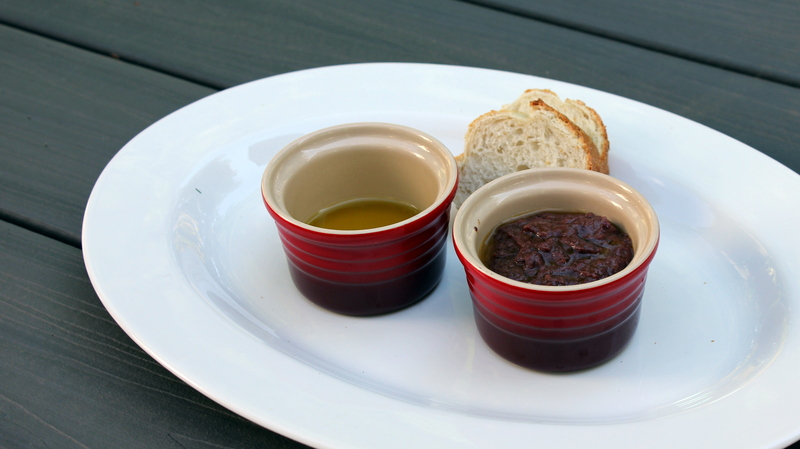 In Crete, this olive paste is made with tiny black olives grown locally and used to produce some of the world’s best olive oil. Here at home, I’ve been using kalamata olives, which give the olive paste a slightly creamier texture, but all in all produce a reasonably close copy of the Cretan staple. If you’re so inclined, it might be fun to experiment with different types of olives in this recipe. Combine all ingredients in a blender or food processor and puree until mostly smooth, with a few small bits of olive remaining. Adjust seasoning to taste. Serve with crusty bread or alongside grilled meats, on sandwiches, with a cheese plate, or tossed with fresh pasta. The olive paste is best used right away, but will keep for a couple of days in the fridge in a covered container. The cupcake versus muffin debate is as old as time. Some say that frosting draws the line; cupcakes are frosted, muffins are not. Others say it’s about the ratio of fat to flour. Still other folks claim it’s about using oil or melted butter (muffins) versus creamed sugar and butter (cupcakes). I like this last one, I think, because fluffy creamed butter and sugar result in a more airy pastry. 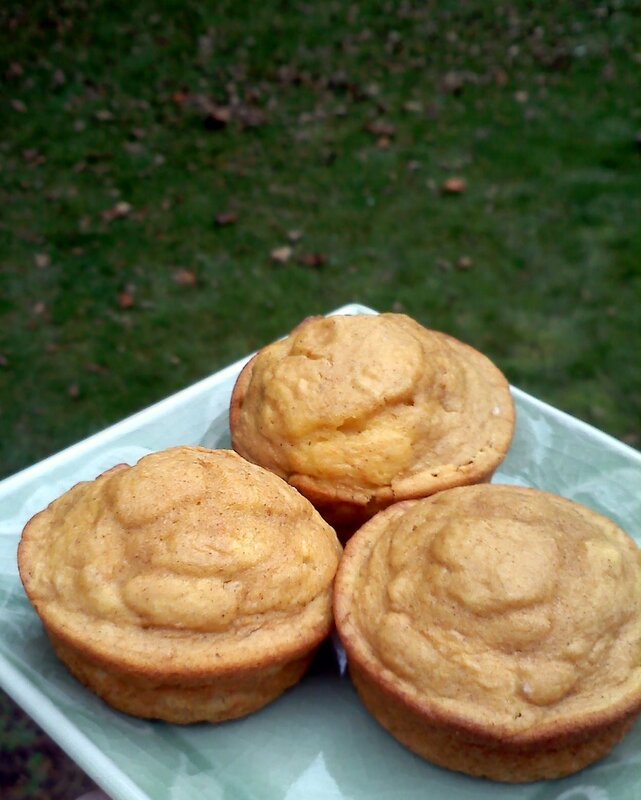 Which is why I’m having a hard time deciding if these pumpkin cuties are muffins or cupcakes. The frosting and soft crumb would indicate cupcakeness. But the frosting could easily be served alongside as a spread, and the butter here is melted and moderate in amount, so I’m thinking it’s really more of a muffin. In reality, it doesn’t matter. They are delicious. Whatever we call them, they are filled with fall flavor and pumpkin goodness, and I have no qualms about eating them any time of day. They would be great for Halloween – for breakfast or dessert! 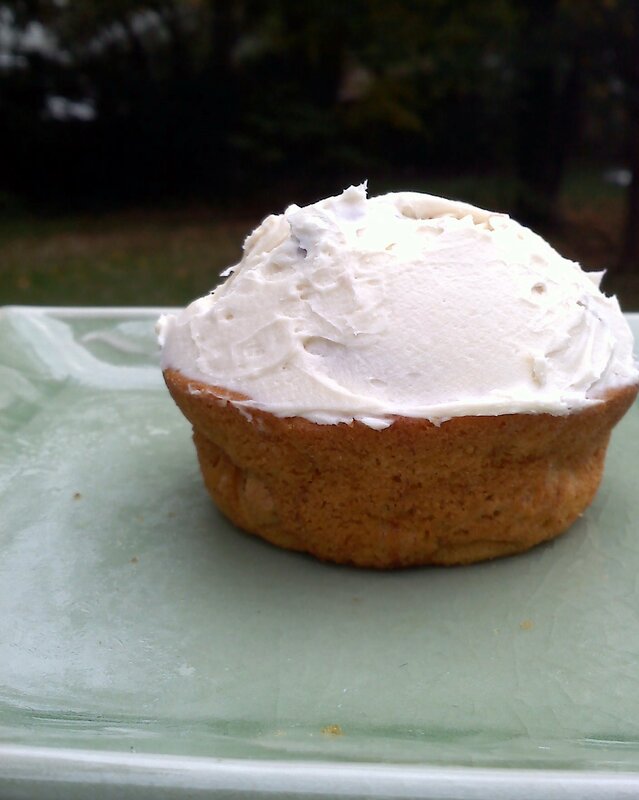 While these Muffins/Cupcakes are lovely on their own, I think it’s the cream cheese icing that really makes them spectacular. My mother-in-law and I share an obsesion for honey walnut cream cheese. She came over for breakfast last week and I bought bagels and honey walnut cream cheese from our local bagel shop. And then I ate up the rest of that cream cheese on graham crackers as a fabulous evening snack through the rest of the week. And when I finished that tub of cream cheese, it occurred to me that I could easily make my own. Just whip some cream cheese, a bit of honey, and a few toasted walnuts together and that’s it! 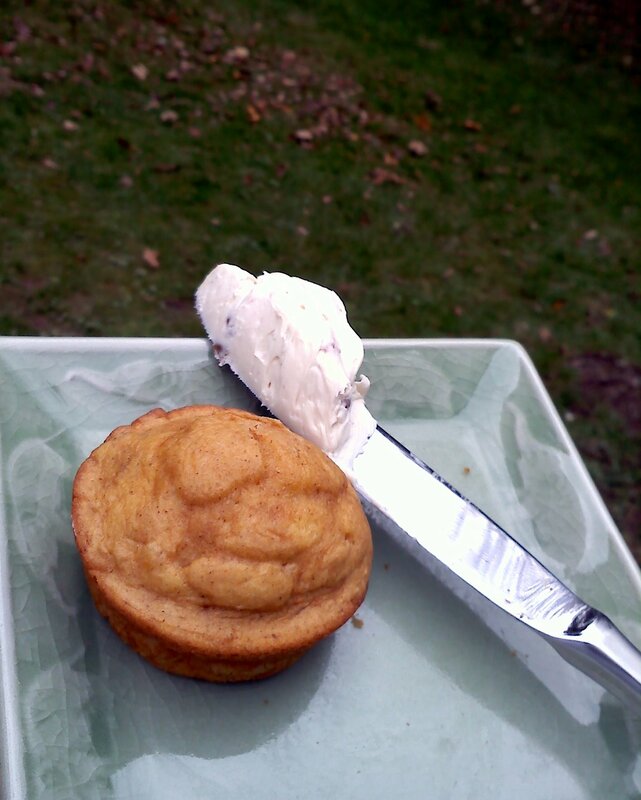 It’s fantastic on toast, on a banana, on waffles, and, of course, on pumpkin Muffins/Cupcakes. Preheat the oven to 350 degrees. Grease two 12-cup muffin tins. Sift together the flour, baking powder, baking soda, salt and pumpkin pie spice. In a separate bowl, wisk together the sugars, applesauce, butter, eggs, and pumpkin. Add the dry ingredients and mix until well combined. Divide the batter among the muffin tins and bake 20-25 minutes until set. Cool. While the muffins/cupcakes cool, make the frosting. 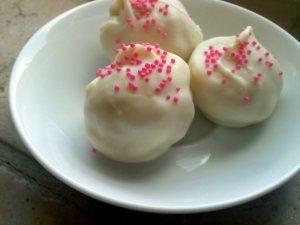 Beat the cream cheese with an electric mixer until fluffy. Add in the honey to combine, and then the nuts. Frost the cupcakes (or serve alongside the muffins!) and enjoy.